Last week, while having lunch out with a friend at Lulu’s, she noticed heart-shaped green onions in her egg flower soup. I snapped a photo and shared it on Instagram. And then I was asked for an Egg Flower Soup recipe. Perhaps you call it Egg Drop Soup? Whichever name you prefer, it’s the beautiful broth based soup with whispy strands of egg in it. I’m guessing the “flower” part of the name comes from how the egg blooms when you add it to hot broth. It does look like it is blossoming. This recipe makes one very generous serving or two small cups of soup if you want to share. This is a quick lunch for me when the kitchen is looking pretty bare. 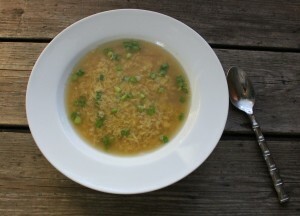 It’s also one of my favorite soups for days when I just can’t get warm or when sickness lurks around the corner. Traditionally made with chicken broth, I make mine with veggie broth. You pick what works best for you! Set a fork and a whisk nearby. Once boiling, turn off the burner and remove the pan from heat. A little bit at a time, pour the egg over the tines of the fork and into the saucepan. Stop after each addition of egg and gently whisk in a clockwise motion. This will help to develop the whispy strands of egg as opposed to clumps of egg. Continue adding egg until all has been incorporated. Serve immediately, garnish with green onions. Optional: Some folks stir in a bit of gluten-free soy sauce, sesame oil and white pepper to taste. I like mine with just the three simple ingredients. This recipe is included in the Gluten-Free Wednesdays Carnival hosted by Linda at The Gluten-Free Homemaker. Click over to see lots of other terrific recipes! 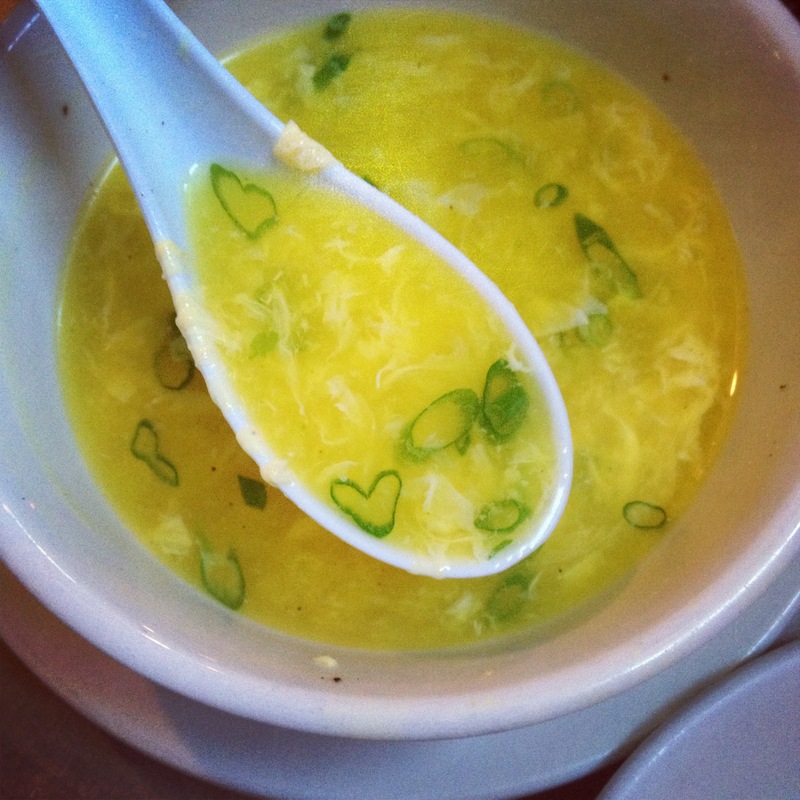 Oh, how I love egg drop soup! Used to be a fave when I ate Asian food out. Love the heart-shaped green onion slices in the photo! 🙂 Hope those who se soy sauce remember to use gf soy sauce. But I’m with you on the simplicity and appeal of just three ingredients. Thanks, Johnna!